Cardiff economist seeing things the Green way! Calvin Jones is Professor of Economics at Cardiff Business School. I have shared platforms with Calvin on a couple of occasions and followed his work for some time. There is ever more convergence in our views. “Worthy attempts to develop replacement technologies in energy generation and storage, in weight saving, in bio-engineering and so on, ad infinitum are born from a belief that technology and increased resource efficiency can solve our ecological and climate problems. This is Walter Mitty land. It is populated by well-meaning, intelligent people to be sure, but a fantasy none the less. On current trends we can expect three billion more people in the global middle class by 2030, at the same time as the West gets richer, albeit perhaps more slowly. To enable this, we require a mere doubling of world electricity production. Let me say this slowly. This. Will. Not. Happen. There is not enough stuff in the world for material consumption to effectively double on a global basis. There is not enough water for the dishwashers, or indeed to drink. There is not enough aluminium for the Audis, and not enough kerosene for the short-haul holidays to Hong Kong. There are certainly not enough prawns for the cocktails. This is not Calvin trying to tell us that technological innovation is a waste of time; just that it is not likely to be enough – certainly for us to continue using resources as we currently do and to continue the lifestyles we still seem to aspire to. I happen to think, and I think Calvin agrees, that technological innovation does have enormous potential to help us re-shape our futures (e.g. http://www.ted.com/talks/justin_hall_tipping_freeing_energy_from_the_grid.html?utm_source=newsletter_weekly_2011-10-19&utm_campaign=newsletter_weekly&utm_medium=email ) But his premise is sound enough, that the current capitalist economic growth model is not capable of delivering either the technological solutions to the masses, or the socio-political change to our societies. “Ah yes, Malthus. There should be a version of Godwins Law for that. In the US kids can already aspirationally look forward to being fatter, unhealthier, unhappier and shorter-lived than their parents. How long, exactly, would you like growth to continue? I am not sure we share quite the same definition of ‘socialism’, but Calvin may be re-assured that modern Eco-socialism, while seeing a bigger role for the state than we have now in providing key public services, is fundamentally based in a belief in localism and the commons. “We need to deal with economic growth, the elephant in the room. Insofar as it relates to the increased material throughput of an economy (and believe me, it really always does) growth is not only undesirable (for the West at least) but in the medium term impossible. Un-discussed in mainstream policy context? He clearly fails to see the Green Party as part of the mainstream at this point in time, but we are the only ones singing from his song sheet! GPEW’s current economic policy (http://policy.greenparty.org.UK/ec) clearly enshrines most of Calvin’s core arguments. It is not perfect, but I would like to invite Calvin to join us and get involved in refining it alongside other ‘green’ economists like Molly Scott Cato. If Calvin wants to see meaningful change, he needs to engage with us in the political system to bring it about. This is the only way we can hope to become that crucial part of the mainstream! Calvin’s information and the map of resources are from a Bristol conference last December, launching the Regen report sponsored by the S-W region. 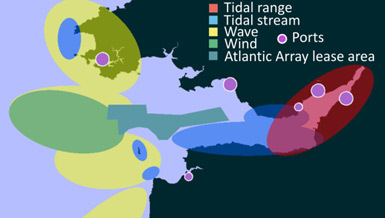 That report failed to mention the front-running Tidal Reef (http://www.severntidal.com/), which has already secured DECC endorsement and is better quantified than lagoons. It would run from Aberthaw to Minehead and generate more power and less discontinuously than the Barrage. While building a consensus to address Calvin’s argument for less power and less consumption, let’s get on urgently with substituting renewable for fossil-fueled power.